Laylani Callaway, 16, was awarded the Johnnie Baker Memorial Award on Saturday, Feb. 17 by Bridge Tender Marina dock master Tripp Brice. Callaway won the award for being the first youth angler to hook a sailfish during the July 2017 Capt. Eddy Haneman Sailfish Tournament, held annually out of the Bridge Tender Marina. The Captain Eddy Haneman Sailfish Tournament honors the late captain’s legacy and brings together local anglers for a charitable cause. Haneman is credited with establishing deep sea fishing in this area. In 1946, after serving in the United States Coast Guard, he moved to Wrightsville Beach with his wife. Every day he showed up to work in his uniform of a khaki shirt and pants with a tie and captain’s hat. A few years after Captain Haneman passed away, local fishermen Tripp Brice, Kit Taylor, and Jimmy Vass organized a sailfish tournament in his honor. Initially, the event began with a mission to promote a local fishery that Captain Haneman knew all too well. 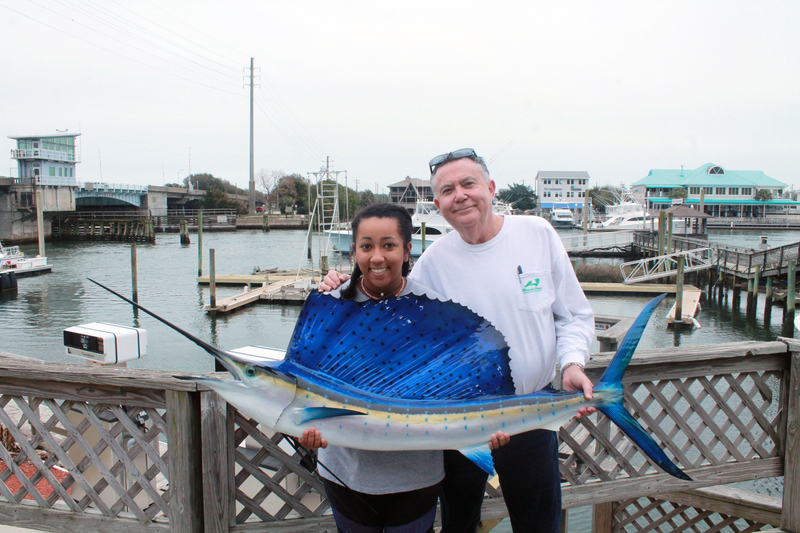 He spent decades catching fish off the coast of Wrightsville Beach, and the tournament’s boundaries reflect upon Captain Haneman’s logs and notes regarding numerous sailfish hauls throughout the month of July. Beginning in 2000, the annual tournament has grown to become the biggest tournament on the beach comprised of local participants according to tournament organizer Tripp Brice. Each year organizers hand-pick an individual or a family in the community that is experiencing some type of hardship, and proceeds from the tournament are donated to provide financial support. While monetary prizes are awarded for the number of sailfish released and dolphin that are brought to the docks and weighed, the tournament raises anywhere from $15,000 to $18,000 annually. Throughout the years over $100,000 has been donated to Lower Cape Fear Hospice and other local charities, said Brice. Junior competitors, ages 16 and under, compete for the Johnnie Baker Memorial Award. Baker, who owned The Bridge Tender Marina, passed away in March of 2017. For hosting the Captain Eddy Haneman Sailfish Tournament year after year at his marina, the organizers wanted to recognize his memory as well. Organizers will not have an official number of boats participating in this year’s tournament until after the captain’s meeting on Thursday evening, although Brice anticipates around 50 entries based on numbers from recent years. “Tournament boundaries allow some of the smaller vessels a chance to take part in the fishing, but weather has such a strong influence on the fleet,” said Brice. Anglers will fish on Friday and Saturday, July 27th and 28th, between 8 a.m. and 3 p.m. daily. This gives participants enough time to arrive back at the docks and spend some time with family and friends. An awards ceremony and cookout will take place on Sunday, July 29th, at noon. To find out more information about the Captain Eddy Haneman Sailfish Tournament, please contact The Bridge Tender Marina at (910) 256-6550.